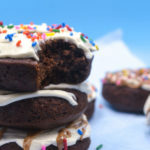 Healthy donuts might seem like an oxymoron, but I promise this veggie donut is the perfect balance of healthy and decadent. These are secretly full of hidden vegetables and with way less sugar than the traditional version. This healthy baked donut recipe could be healthy breakfast for kids or a fun snack. Your family will absolutely adore these chocolate veggie treats but will be none the wiser to the fact that they’re actually better for you. Okay, I’m going to admit it: I bribe my kids at the grocery store. 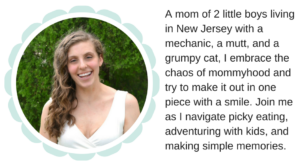 I’m kind of embarrassed by that but also, not, because grocery shopping with small children is essentially hell. Whatever it takes to maybe, possibly take a small fraction of that away? I’m game. Because of this little habit, my kids have grown fond of all things donut. You see, some days I promise them pouches, or a piece of bread or a new box of their favorite granola bars. And some day I tell them if they are really, really good the entire trip, I will go grab them the sprinkley-est donut I can find in the grocery store’s pastry case. I’m not proud of it, but that’s parenting, right? Balance, bribery, and doing what it takes to keep your ish together, right? RIGHT? While I keep the treats to a minimum, I would be lying if I said that the occasional temper tantrum didn’t happen over appropriate donut times. I’ve been dying to figure out a healthier solution but had some kind of mental block on it until recently. Recently I was talking to a friend about the issue and, as always happens when you talk things out loud, it came to me all at once. What if I could make healthy donuts? You know, so I could give my kids donuts without the guilt, kind of like that time I made spinach brownies. Off to Amazon I went and bought a silicone mold. The day that baby came in I was off and experimenting! It took a few attempts, but I eventually landed on this healthy veggie donut recipe. But shhh – no one will know, I swear! It’s packed with beets, pureed the same way I do in my beet smoothie. 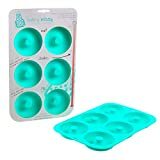 I used this silicone donut mold for my healthy donuts – it’s a cheap pan, but works great! It doesn’t hurt that the color is totally amazing, either. Feel free to switch up the veggie used. I used beets here because they go well with the chocolate and it’s an easy way to get in a difficult veggie. Learn how to make vegetable purees here! Also feel free to play with different juices. I’ve used cherry and pomegranate here, but anything will work. Try veggie juice as well – but you might need to increase the sweetener. The easiest way to get the batter into the pan is the put it into a gallon zip top baggie, cut a hole, and pipe it into the prepared pan. Fun toppings are always a win on healthy donuts – try sprinkles, nut butter, mini chips, seeds, dried fruit.. really anything will work! This recipe, just like my favorite sweet potato muffins, are perfect for breakfast for kids on the go, as an after school snack, or as a healthy dessert. I topped mine with a cream cheese and yogurt mix that is sweet and tangy as well as a drizzle of almond butter, but you can use just about anything! 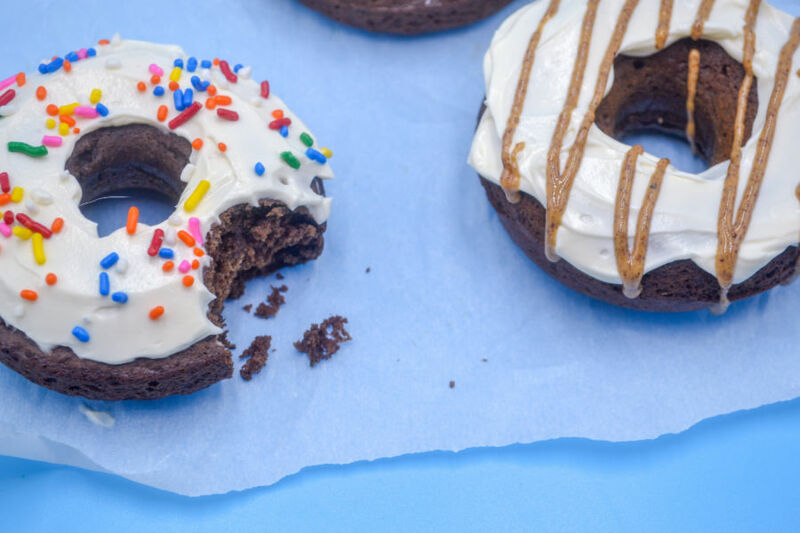 Want to get the kids involved making this healthy donut recipe? 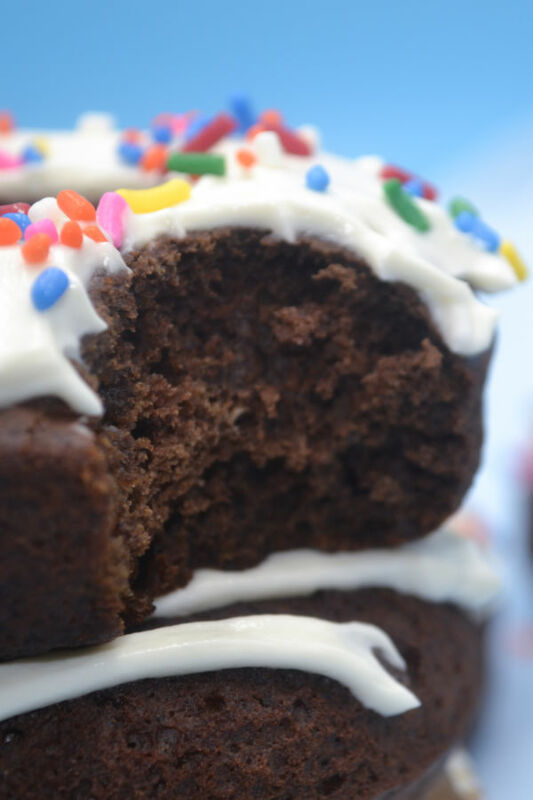 Kids would love to help piping the batter into the molds or whipping together the frosting. But most of all, they will adore having the ability to decorate the donuts! Feel free to bake them the night before or while the kids are at school and have a decorating party! 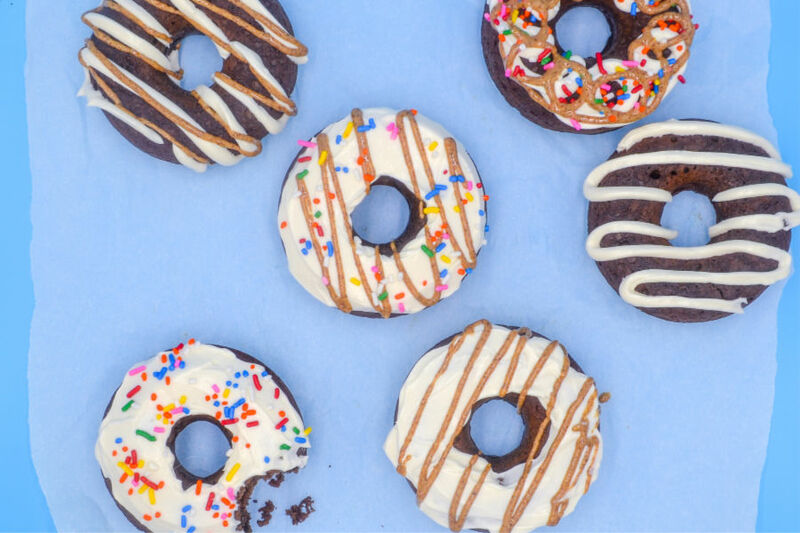 This healthy donut recipe is the perfect balance of healthy and decadent. Secretly full of hidden veggies and with way less sugar than the traditional version, these baked donuts could be healthy breakfast or a fun snack. Preheat the oven to 350. Spray the muffin pin with non stick spray. Combine dry ingredients in a bowl. Whisk together wet ingredients in a separate bowl. Combine the wet and dry ingredients, being careful not to over stir. Baked for 8-12 minutes or until a toothpick comes out clean. Remove from the pan and allow to cool completely. Whip the cream cheese until smooth and light. Stir in the yogurt, vanilla, and sweetener of choice. Starting with 2 tablespoons, add the milk until thin enough to create a frosting. 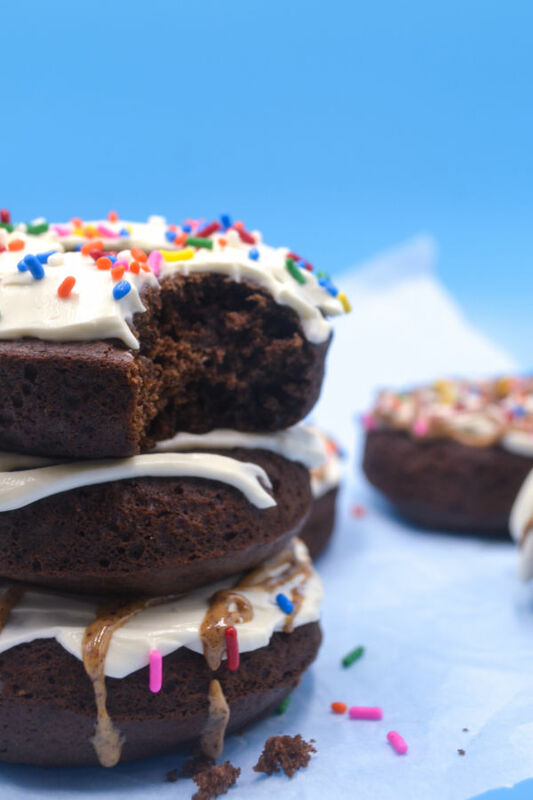 Top your donuts with the frosting and any toppings you may desire! You can use any vegetable puree, but I used beets since they pair well with chocolate and it’s a very kid friendly way to get them to eat it. Again, any juice – I used cherry once and pomegranate a second, but anything will do. You could also easily use vegetable juice, but keep in mind the juice does add a bit of sweetness. You can bake these in muffin form, but donuts are just way more fun! Okay so tell me – would your kids love these as much as mine did? What veggie do you struggle to get them to eat? Let me know in the comments! Looking for more healthy kids recipes? Check out these! Brilliant! I can’t wait to try these for my boys! How much cocoa powder? It doesn’t specify. Hey, Rebecca! Thanks for pointing that out! It’s 1/3 cup. I’ve updated the recipe to reflect. Do these come out soft like a cake or chewy like a brownie? They definitely come out more cakey than chewy!